Behr Enterprises is the premier metal fabrication company for businesses who outsource fabrication, welding, and assembly. Our metal fabricators hold themselves to the highest standards, accepting nothing less than high quality, fast turn-around, and expert customer service. Behr provides custom stainless steel fabricating services with rapid turnaround and superior craftsmanship. Enjoy stainless steel counters, cabinets, and backsplashes custom made to fit your desired space and with the durability to last a lifetime. Behr Enterprises, LLC specializes in metal fabrication, welding, and assembly of a variety of products for industrial, residential, commercial, and food service customers. Whether you are looking for a one time specialty design product, such as a custom stainless steel countertop, or manufacturing capabilities for high volume product lines and outsourcing, we can meet your needs. Quality Is Our #1 Priority. Behr Enterprises is dedicated to providing the highest quality products with “drop everything” service. Whether you choose Behr for our welding, forming, assembly, or any other fabricating service, you can expect a product of high craftsmanship, finished in a satisfactory time frame, and perfectly packaged for delivery. Behr Enterprises is a Wisconsin metal fabrication company offering quick turn-around with competitive prices. Services provided at our Wisconsin fab shop include laser and water jet cutting, welding, assembly, metal forming, stainless steel work, and much more. Proudly offering “drop everything” service ensures every job is completed in the quoted time with the end result being the highest quality in the industry. Our metal fabricators have dedicated years to perfecting their skills. Pairing such a substantial level of experience with state of the art machinery and Six Sigma mastery allows you to flourish with Behr Enterprises. Working with a metal fabrication shop that has the capabilities and skills to fabricate metal for industrial, commercial, and residential customers will provide you with the quality results you desire. Whether you are an industrial company in need of regularly fabricated metal pieces, a restaurant owner wanting stainless steel counters, or a homeowner who wants a one-time specialty design product, superior services await with the professionals at Behr. Contact Our Custom Metal Fabricators To Learn More About Our Metal Fabrication Capabilities And Services. Whether you need stainless steel countertops for your restaurant or hospital, or you are simply a homeowner looking for modern and easy to clean counters and cabinets for your home, Behr Enterprises will deliver flawlessly cut and finished stainless steel products, custom made to fit your desired space. Stainless steel is gaining popularity outside of industrial settings. It’s no longer limited to commercial applications, many residential homes are investing in stainless steel for their homes and garages. Behr Enterprises can create custom stainless steel countertops, tables, even cabinets and back splashes for residential or commercial use. Stainless steel is guaranteed to last for decades. It will not rust, chip or fade and the natural color is sure to complement any existing design. Stainless steel holds its shape, despite extreme temperature variations or humidity. It’s versatile for use in a wide variety of settings, perfect for any kitchen, garage, workshop, deck or patio, business, and more. If you can dream it, we can build it. Learn More About Our Stainless Steel Fabrication Services. We also provide superior metal fabrication throughout Northern Illinois, down to Chicago. From precision metal fabrication services for your home, to business requests, or if you’re looking for a custom component, rest assured Behr-Enterprises only produces the best. With a Six Sigma Black Belt certification and a team of dedicated metal fabricators, the Behr Enterprises team guarantees the highest levels of quality and precision. If you need a replacement part, or something designed from scratch, you can have it done here – even rush jobs. We design custom components fabricated to meet even the most stringent demands. Every member of our team is performance driven and adheres to strict quality control standards. Learn More About Our Precision Metal Fabrication Services. Behr Enterprises is your number one source for everything related to metal fabrication services. When your business engineers or assembles products, your customers often represent large-scale companies who need massive production numbers in record time. A reliable fab shop like Behr Enterprises is more than capable of turning out the highest quality products in a timely fashion. Having high standards is a must and this is what we will provide every time. We manufacture all products to the highest standards, from small specialty jobs to large mass production orders, we promise quality results every time. In other words, Behr is the metal fabrication company for you! We provide water jet cutting services which surpass the industry norm. Water jet cutting allows our fabricators to cut virtually any material, soft rubber and hard alloys, even stone such as marble and granite can be cut to precise, customized specifications. This fabricating method does not generate heat like laser cutting. With the absence of heat, there is no warping of the metal while the material is being cut. The water jet cutting process gets finished in less time and since water jet cutting creates little to no rough edges or burrs, finishing practices like sanding and grinding are eliminated. Our talented fabricators use water jet cutting to create a product custom designed for your needs. From crafting 3-D objects to cutting sharp corners, our water jet cutting process can create a variety of shapes with ease. No matter what you need cut or fabricated, our skilled metal fabricators will produce the products you need with exceptional precision. Utilizing our water jet cutting capabilities means you’ll receive flawlessly cut products supplied with unbeatable turn-around and amazing customer service. Contact Our Water Jet Cutting Experts For Metal Fabrication Services Exceeding Your Expectations. Behr Enterprises has a team of highly skilled welders, accomplished in both MIG and TIG style welding. Our team takes the time to assess the type of metal being welded, then uses the technique best suited for each particular job. We produce high quality welds which meet your project deadlines. Our Wisconsin welders pride themselves on quality products and outstanding customer service. 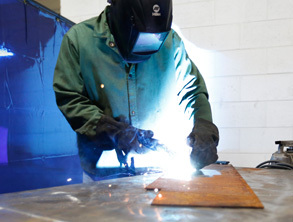 We use only the highest quality wire and filler materials in our MIG or TIG welding jobs. The combination of high quality materials and the skill of our welders produce a consistently strong, solid weld. No matter the project or the deadline, we have the ability to meet and exceed your expectations. Contact Behr’s Wisconsin Welders For Expert Services Exceeding Your Expectations.